The AC motor bearing under study has had a history of high temperature and overheating, particularly in the summertime. The object of this investigation was to evaluate the performance characteristics of the motor bearing with respect to the temperature characteristics and bearing lubrication. The motor in question is an Allis-Chalmers Series 45647, frame H5164 motor. The motor is rated for 4,000 HP and the motor was uprated from 715 RPM to 894 RPM . The motor rotating element weighs approximately 8,500 lbs. The total motor weight is 23,300 lbs. The motor length is 97 in. The bearing diameter is 7.50 in. and the total bearing length is approximately 7.75 in. The effective length of the bearing for carrying load is 6.0 in. The bearing is a split half bronze sleeve bearing with an effective bearing arc of 120°. There is an oil supply groove of approximately 30° on each side of the bearing. The bearing is currently lubricated by two oil rings. A number of aspects of the motor bearing system were evaluated. First, the critical speeds of the motor were computed. The motor manufacturer claims a critical speed of 4,875 RPM. The computation of the critical speed showed that it could be as low as 2,000 RPM. This is sufficiently above the operating speed to not represent a problem. The next step of the study was to analyze the load capacity, bearing stiffness and damping, and temperature rise in the sleeve bearing. Calculations were made for the bearing under various conditions of bearing clearance, load, and speed for the temperature rise and required oil flow requirements. The sleeve bearing is classified as heavily loaded and a positive oil supply system must be provided to the bearing to prevent overheating with conventional lubricants. A bearing cartridge was supplied to RODYN Vibration for evaluation. A finite element model was generated for the sleeve bearing and a deflection and stress analysis was performed on the sleeve liner. The sleeve is only partially supported by the bearing housing. The center portion is not supported, in order to allow for clearance for the rotation of the two oil rings. 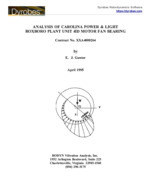 The analysis shows that the bearing deforms in the center and may rub on the ends. Examination of the bearing shell indicates rubbing on the bearing ends. The deformation of the bearing shell can also lead to heating.